Just as I am sitting down to write this post I’m realizing that this is my third dessert in a row that is some combination of peanut butter and chocolate . . .
. . . and I have another one coming next week. ???? I think it is safe to say I’m obsessed. Chocolate and peanut butter is definitely a weakness of mine. 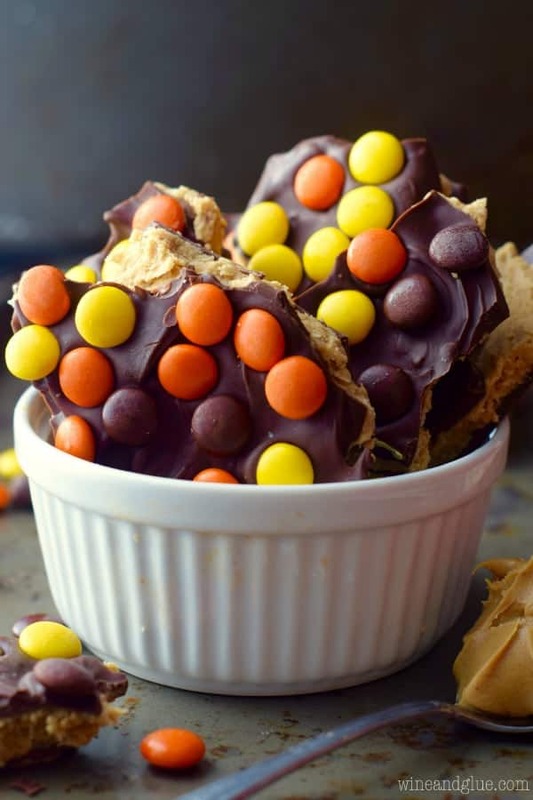 I don’t have a huge sweet tooth, but when I want something sweet, I totally want something chocolatey and peanut buttery these days! 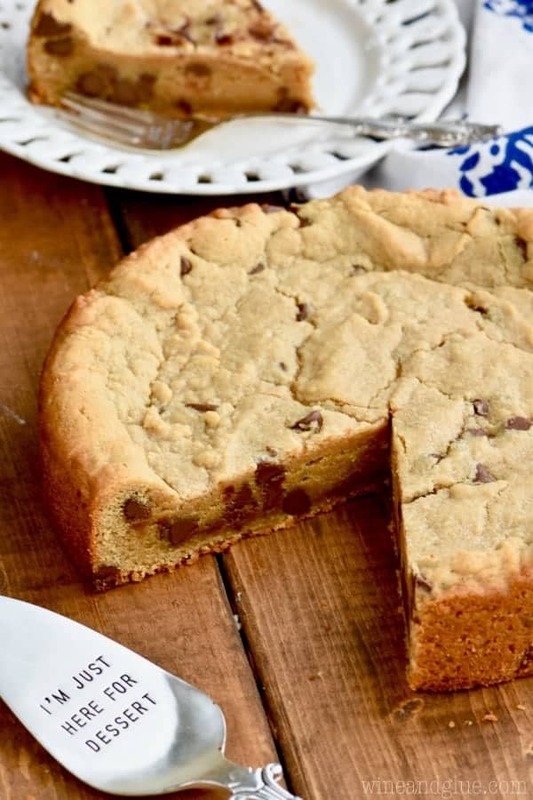 This Peanut Butter Chocolate Chip Cookie Cake is really just a cookie recipe in the form of a giant cookie cake. It is super easy to make, and even easier to eat. 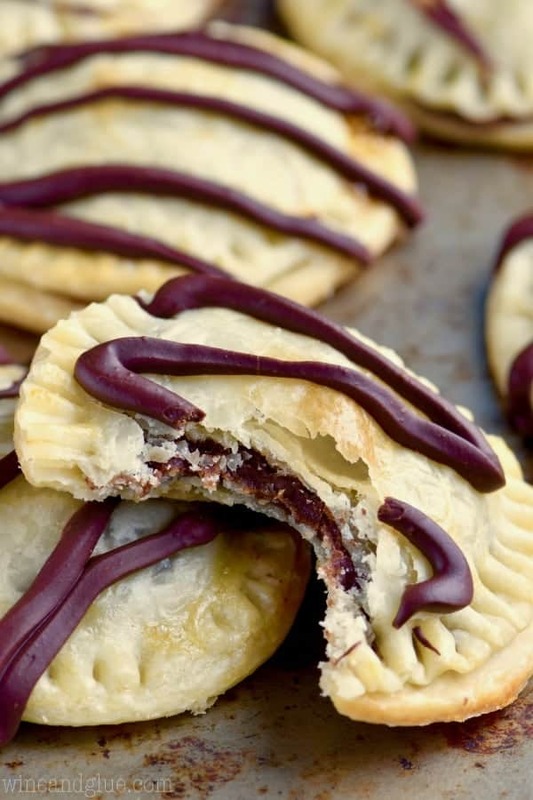 The edges are nice and crisp and the center is gooey and delicious. Just like you want your cookies to be. I need to put together a post on all my cookie making tips, but I will give you a few of them here to help this bad boy turn out perfectly. Butter. Make sure your butter is room temperature. I have a few recipes, especially my vanilla buttercream frosting, that get ruined by butter that is not the correct temperature. Room temperature butter means that you can dent it with your finger but you can’t easily push your finger all the way through the stick. You can get there quickly by cutting up the butter into one inch pieces and leaving it on your counter for a half hour. There are some climates that if butter is left out for more than an hour it will be too soft and won’t be right for your recipe. And for the love of chocolate chips, please don’t microwave your butter to get it the right level of softness! Eggs. Just like your butter, you want them to the be room temperature. Make that happen fast by filling a bowl with luke warm water and setting the eggs (still in their shells) in the bowl for about three minutes. Baking Powder and Baking Soda. These guys need to be new about every six months. You can test if they are good to go by dropping baking soda in some vinegar, and baking powder in water. If you don’t see bubbles right away, you know you need to get a new supply. Flour. It’s really important to measure your flour correctly. You want to scoop it (using a spoon) into your measuring cup and then level off. If you scoop right from your flour container, it can get packed in the measuring cup and you will end up with more flour and dry cookies. No one wants that. Oven temperature. Guess what?! My new oven in my new house started burning recipes that had previously worked great. Turns out it was heating to about 50 degrees higher than what I set it to! Check your oven temperature really easily with an oven thermometer. 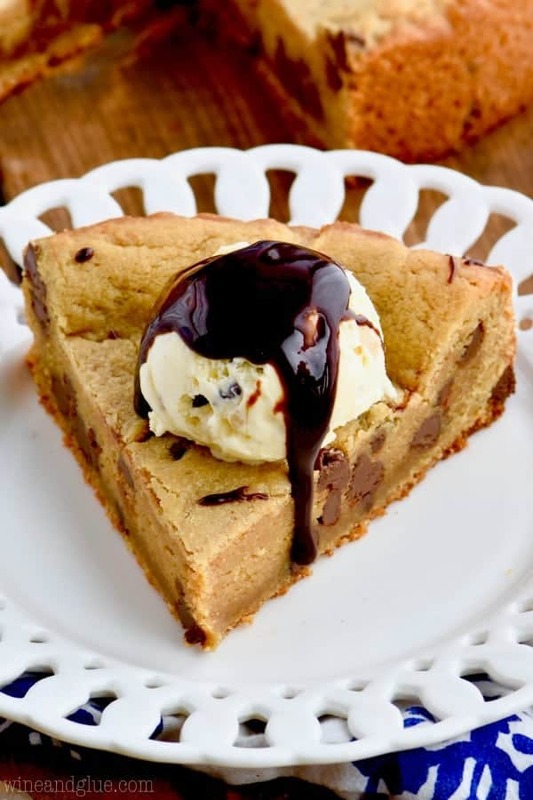 Most importantly, top your Peanut Butter Chocolate Chip Cookie Cake with ice cream and hot fudge. ???? In a large stand mixer, cream together the butter and sugars until light and fluffy, about three minutes. Then beat in the peanut butter until combined, scrapping down the sides as needed. Beat in the eggs one at a time, and then beat in the vanilla. 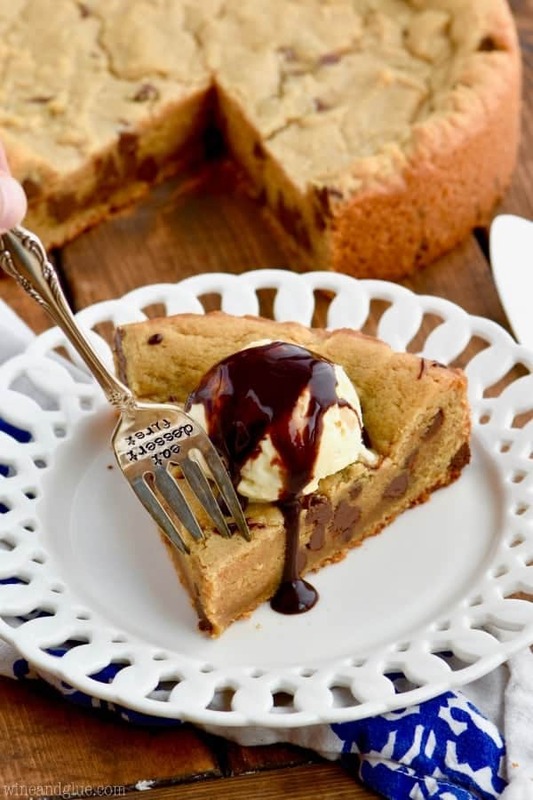 Scrape down the sides of the mixer and then using a spatula gently fold in the chocolate chips. Allow the cake to cool in the pan for twenty minutes. Gently run a knife between the cake and the edge of the pan, then remove the side of the pan. Cool completely before cutting and serving. 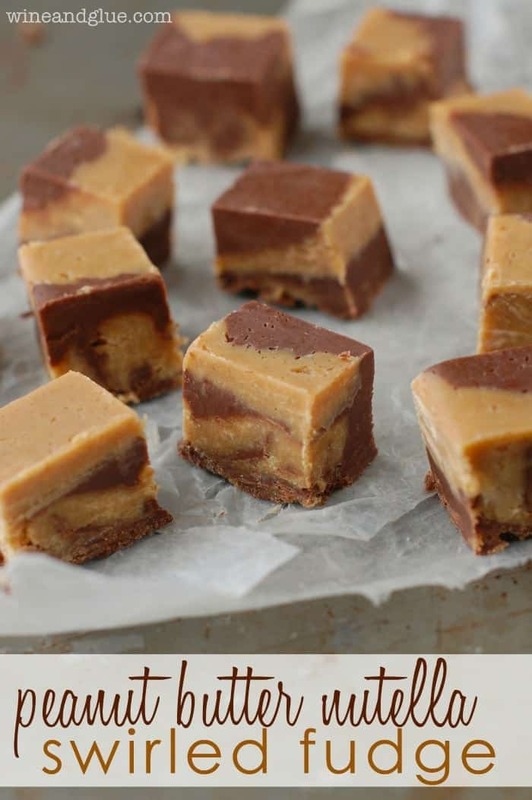 Looking for more peanut butter and chocolate? This looks delicious, and I would love to make it but don’t have a spring form pan. Can I make it it another size/ type of pan? You could make it in a 10 inch pan, but you would want a shorter baking time. If you make it in a non spring form pan, I would suggest lining it with aluminum foil and spraying that. It will make it easier to get out. That looks soooo good! My kids would love to have this for snack. Thanks for sharing.